Mulholland Family History: "Ireland, Civil Registration Marriages Index, 1845-1958"
"Ireland, Civil Registration Marriages Index, 1845-1958"
For some time I have been perplexed by the marriage index entries for my great grandparent's John Mulholland and Elizabeth M'Williams showing at Ancestry.com in the "Ireland, Civil Registration Marriages Index, 1845-1958". This database originates from the “Ireland, Civil Registration Indexes 1845–1958,” Index. FamilySearch, Salt Lake City, Utah. The records were filmed at the General Registry office, Dublin in 1953. In April 2013, I obtained a photocopy from the GRO, Dublin, of the marriage register entry for their marriage which took place on 23rd December, 1895, at St Anne's, Church of Ireland, Belfast. The photocopy has the page number '310' showing in the upper left hand corner of the page. 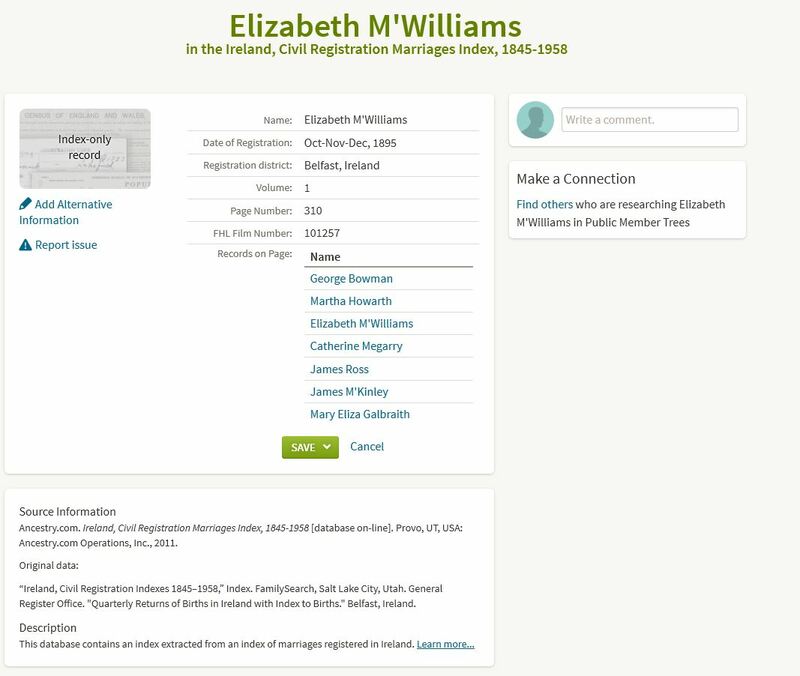 When I looked at the index entries on Ancestry.com, the entry for Elizabeth M'Williams did not list John Mulholland as one of the other names on the page for vol. 1, p. 310 of the Oct-Nov-Dec 1895 Index. 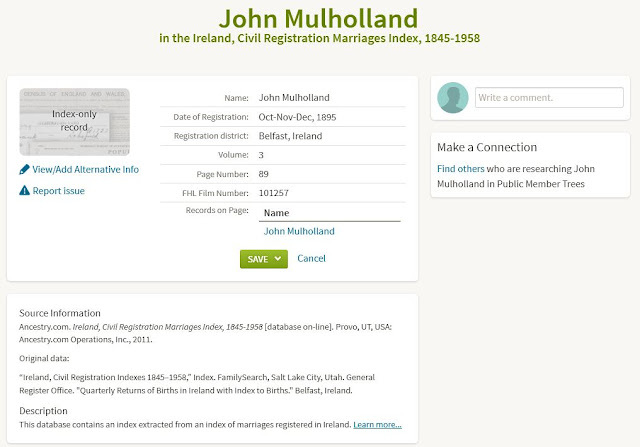 Also the entry for John Mulholland listed him as being on vol. 3, p. 89, with NO other names listed on the page. 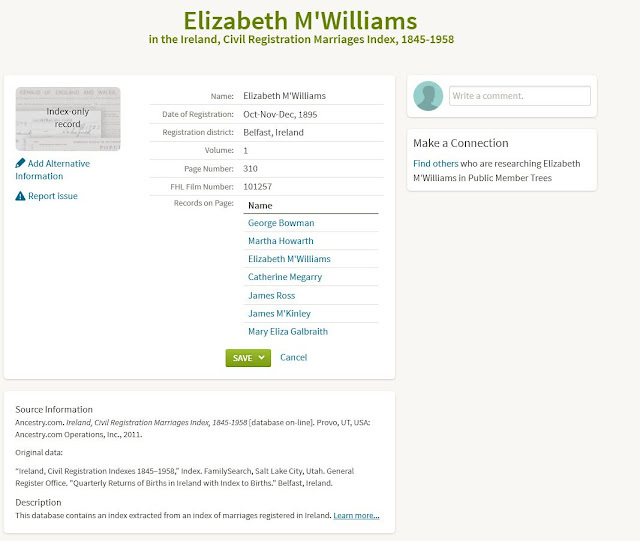 Yesterday, I was preparing for some other research, when I noticed that the FamilySearch.org catalog[ue] entry for the 'Ireland, civil registration indexes, 1845-1958', which includes 'Marriage records, 1845-1870, with indexes to marriages, 1845-1921, in the General Registry Office of Ireland', now has a camera icon in the column headed 'Format', in the section 'Film Notes', for a number of the listed FHL microfilms. The camera icon allows you to browse the film online. This feature was announced on the FamilySearch.org blog back in November 2015. A few days ago I went back to the FamilySearch.org site to try to view some other films from the 'Ireland, civil registration indexes, 1845-1958'. However, I found that the camera icon was missing for all of these films. I raised a support case with FamilySearch and enquired as to why the camera icons were missing. Today I received a reply, apparently the legal contracts for these particular films have been reviewed. These films are no longer available online and must be ordered in to a Family History Centre. When I selected the appropriate FHL film, i.e. 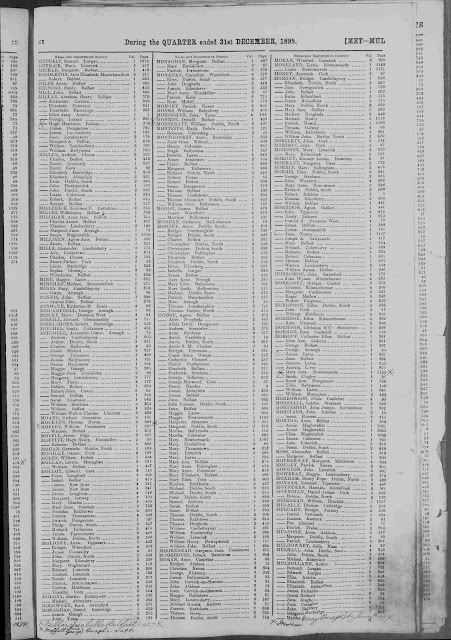 101257 and started browsing for the index entries for my great grandparents, I noticed that page 23 for the Oct-Nov-Dec 1895 quarter, which lists my great grandfather had been filmed twice. However, the second image # 436 had the lower right hand corner of the page torn away and a blank piece of paper was placed behind the page, highlighting the fact that the page had been previously torn. Image 436 with page 23 showing missing lower right hand corner. When I scrolled back to image # 435 and inspected the corner of the page more carefully, I noticed that the page indeed had been torn in the very area that my great grandfather's index entry appears. Image 435, index page 23, with page 25 showing through in the lower right hand corner. I then scrolled to image # 438 and noticed that the lower right hand corner of page 25 was actually showing as the lower right hand corner of page 23 in image # 435. It can be seen that vol. 3 p. 89 is actually the index entry for Annie O'Neill on page 25 and not the correct entry for John Mulholland. Therefore, all the volume and page numbers for the individuals listed in the torn area of page 23 are incorrect. Of course, there are other individuals missing from the lower left hand corner of image 437 of page 24. They all have the family name MURPHY. 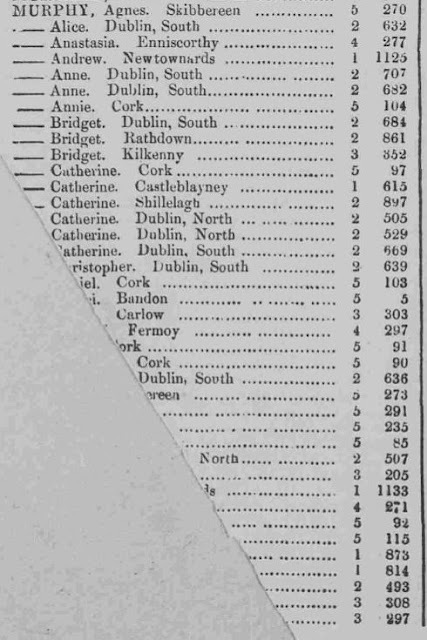 The last individual showing correctly is Catherine, and the next one showing correctly at the top of the centre column is Jane, so any Murphy that was married in that same quarter with a christian name listed between Catherine and Jane is more than likely missing from the index or indexed with only a family name and no christian name. I did some checks, and it appears the entry below Catherine would be for Christopher Murphy, and this entry actually does appear in the index. However, the next entry which I would presume is Daniel, only appears as ? ?Iel Murphy. 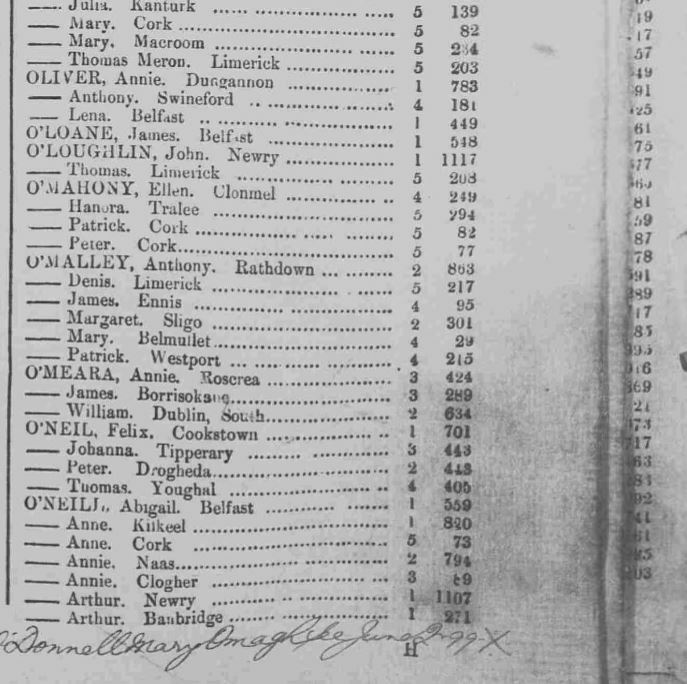 There are at least 21 entries in the name of Murphy with no christian name appearing in the index. This scenario highlights the fact that we cannot always take an index record at face value, its construction may rely on a damaged document. 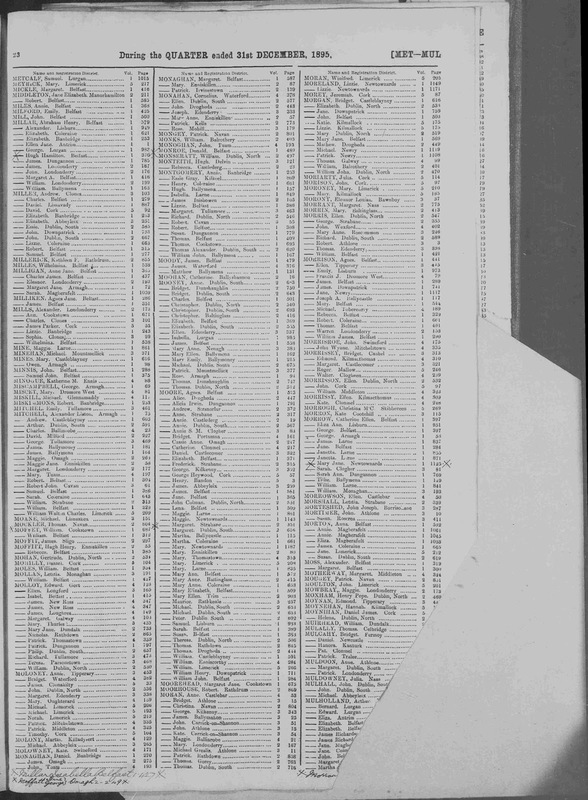 In this case the index shows incorrect details for several individuals and it possibly explains some missing Murphy entries. We should always try to view the original document, in this particular case the printed index, to inspect it for any damage and or alterations.